More often than not, the thought of revision fills learners with a sense of dread. To help put your students at ease this exam season, we’ve highlighted just some of the resources available on our quality assured GCSE revision hub. Jam-packed with information on the major religions and their core beliefs, surely there’s no better way to kick-start pupils' revision than with these lessons, practice questions and stimulating activities? This is a great resource for getting pupils thinking about how exam questions are formulated. It is designed to get pupils into the mindset of the chief examiner to see how they could word questions based on the 4 questions that are in the exam (a-d Key Words, Describe, Explain & Evaluate). This is also great for revision and keeping pupils ‘on their toes’ as the topic and questions that come up are random. You can copy and paste the Exam Question Generator slide into any presentation you wish or use the slide as a standalone resource. 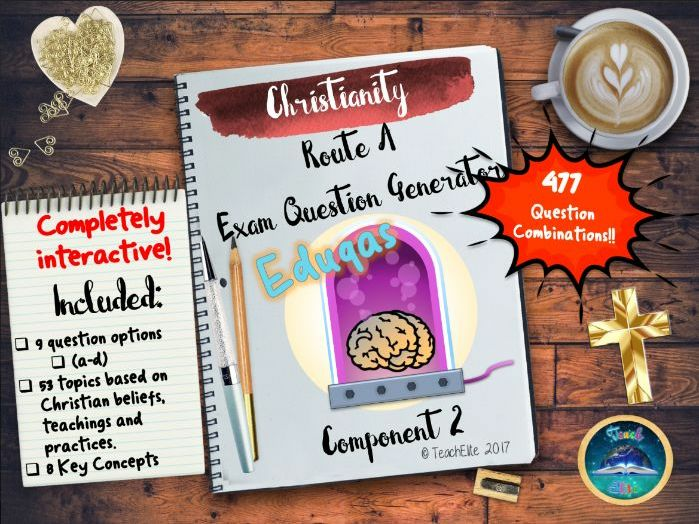 The Exam Question Generator will generate the start of an exam question and an area of content that you have taught the pupils for Component 2: Christianity. This will then enable you and/or the class to come up with an exam style question based on the selected question and topic generated. Contained in the selector are 53 topics based on Christian beliefs, teachings and practices. That’s over 477 question combinations!!! There is also a separate revision selector for the 8 key terms that pupils need to know for part a questions. There are many more resources that you will love in our shop. We hope that you enjoy this resource! If you review this resource we will give you another resource of the same value for FREE. We would love your feedback, if you like what you see, please follow us: on Tes <a href=“https://www.tes.com/teaching-resources/shop/TeachElite”>TeachElite’s Shop</a> click the’Follow this Author button’ . We will keep you updated on any sales we throw or FREEBIES we upload. Ready to print assessment and mark scheme for Buddhist Practices. Easy to uses and tried and tested - also includes grade boundaries break down. A list of practice GCSE Style questions for the AQA GCSE RS 9-1 (2018). Based purely on own teaching and examination structure given by AQA. A list of topics to be covered for the 2018 (9-1) GCSE RS Christianity unit. Starters for GCSE AQA Christianity beliefs. Good for literacy and revision. Perfect for starters to hand out at the door as quick tasks to get pupils focused straight away. Used for revision and for literacy. This revision guide accompanies the Christianity: Practices paper in the RS GCSE. It has an accessible guide to all the different parts of the unit such as Holy Communion and pilgrimage. Each section has a 12 mark question with possible points students could make. At the back of the revision guide there is a glossary of key terms as well as a variety of different possible exam questions. 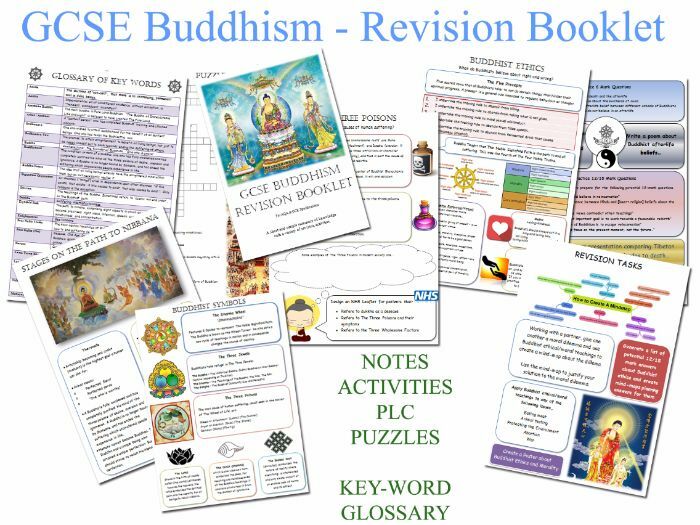 GCSE Buddhism - Revision Workbook (AQA/OCR) - Revision Activities, Notes, Tasks - 40 PAGE BOOKLET! This download is for GCSE Religious Studies teachers covering Buddhism as a comparative religion. 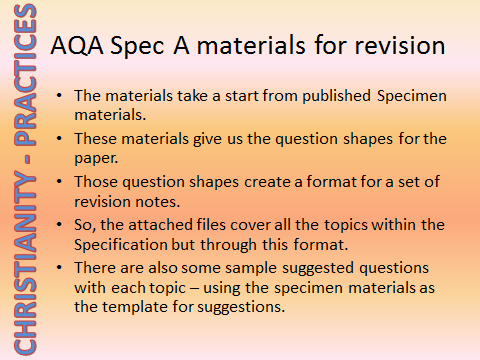 It is especially useful for teachers using the AQA/OCR exam specifications. It is a 40 page Word document (easily amended, edited or added to). It is intended to be printed as a double-sided A4 booklet and given to students as a revision aid. It is ideal for teachers without textbooks, or who cannot allow students to take textbooks home. It can also be given to students at the start of the course and will help them with homework tasks and revision. Positive reviews always greatly appreciated. 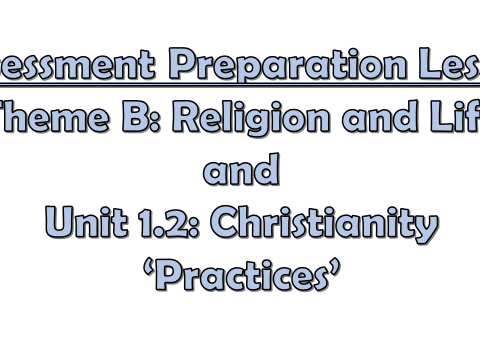 Topic by topic (21 files in total), the Specification section for Christianity (Practices) is covered through the prism of the types of questions asked in the sample materials published by AQA. This means the students can have a set of notes covering the areas they need to know for the exam. These topic sheets also offer some ideas for questions for every topic in all the questions types found in the exam (1, 2, 4, 5, 12 mark questions) based on all the formats published by AQA to be able to see each topic in exam terms in both knowledge and evaluation style questions. How to use - whilst written as revision sheets, and given that they unpack the Specification, the sheets could be used as the basis for teaching each topic, or could be used as homework sheets (as they provide the information and some sample questions). They could also be simplified or used in comprehension tasks as well as discussion and for exam question practice. They are suitable for full course GCSE. they were written for Y10, but the same would be used with Y11. More to be posted - on other religions - when completed. This is the revision, review and assessment lesson for Theme B: Religion and Life. I have chosen to ask pupils to revise and prepare for a 48 mark assessment rather than just a 24 mark one. This means they will be doing an additional 24 mark question on Christianity: Practices. My rationale for this is to give the pupils a chance to revise content from last year and to ensure they are keeping on topic of all key words. Two 24 mark assessments based on exemplar papers and questions provided from the exam board.